This game has an awesome aesthetic, one of my favorite general game stylings, but regrettably I just couldn't have any fun with it because for me the shooting trajectory seemed unpredictable/not working? 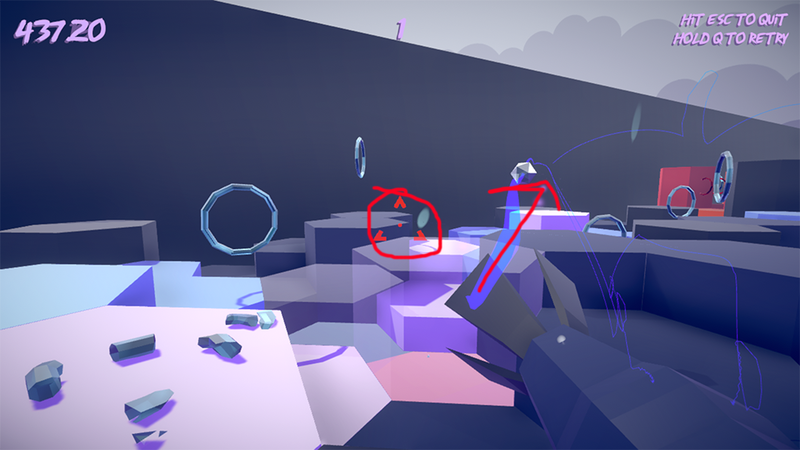 There may be a trajectory disconnect somewhere or mouse angle issue, but sometimes it would launch the projectile from far to the right, sometimes to the left, sometimes in the center. I couldn't workout any pattern like it being related to world axis or anything, and it meant I couldn't really find any fun in it enough to try and complete it, as even directly next to a hoop would sometimes miss because of the shot offset. Still the concept behind it is neat, it'd be fun trying to manouver the bullets around hoops after they're launch, especially within the idea of a time race. Being able to shoot once and move the bullet around to hit 2/3 hoops along the way and save time would be cool. Maybe I was missing something, or maybe you can consider making the initial trajectory more reliable, but still it's a nice looking package I wish I could enjoy and I like the idea behind it.